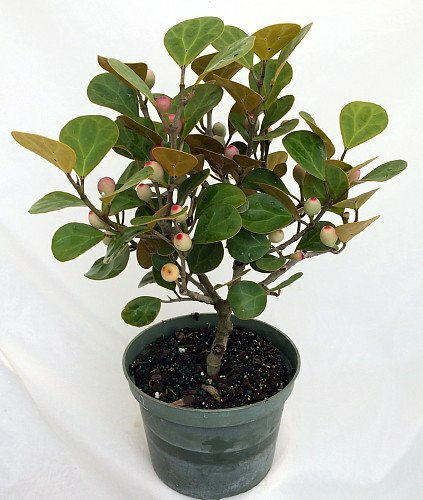 Makes a great bonsai or house plant Proper Name: Ficus deltoidea It is tough, durable and responds well to normal house plant care Excellent for home, office, dorm or apartment The plant you will receive is growing in a 6" pot. Mistletoe Fig Bonsai Tree, scientific name Ficus deltoidea, is a slow growing tree native to the tropical climates of India, Asia and Africa. It produces small orange and red fruits that look just like mistletoe, hence the name Mistletoe Fig. It has a slender gray trunk topped with oval shaped leathery, bright green foliage. The Leaves have tiny brown spots and look just like mistletoe. It also develops interesting aerial roots. Ficus deltoidea is the only Ficus species that will produce fruits when cultivated indoors. It produces inedible pea sized fruits "figs" all year round. The figs turn from dull yellow to orange and red. Makes an excellent house plant or indoor bonsai.